The University of Alicante organized during the month of February, 2013, a series of visits by students and teachers of Higher Level Training Cycles to a number of facilities at the University of Alicante to develop work related performance IEC areas CAMPUSHABITAT5U. 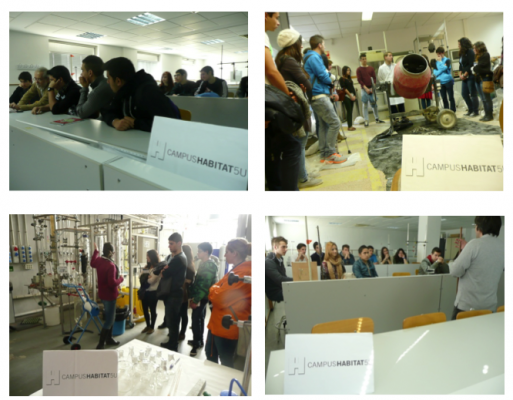 Thus, about 250 students from 20 schools in the province of Alicante which impart Higher Level Training Cycles visited the following facilities of the University of Alicante, specifically the School of Engineering. On the one hand, visited the Laboratory of Materials and Structures Technology, where managers and technicians could expose the same work done on it in the field of construction, related structures and facilities, new building materials safer and more efficient , reliability and structural safety, etc.. They also visited the Robot Vision Laboratory, where they could see the progress and the potential of computer vision research, object detection and recognition, as well as their integration in robotic applications, can have on home automation and home automation, helps people with disabilities, etc.. Finally, visited the Laboratory of Industrial Computing and Artificial Intelligence, where professionals in charge of it were shown the importance of new developments in these fields can contribute to improved efficiency in resource management, energy saving, safety, etc.. Additionally, accompanying teachers of these students held meetings with officials of the university access in order to clarify concepts related to income college students.